The Redskins suffered a major blow this week. In addition to losing 38-14 to the Falcons, the Redskins are also down three key players. Guard Brandon Scherff (torn pectoral), guard Shawn Lauvao (torn ACL), and WR Paul Richardson Jr. (AC joint) will all undergo surgery, ruling them out for the remainder of the season. 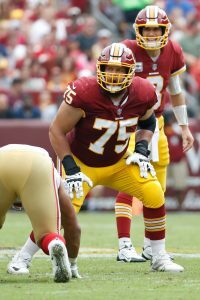 Losing Scherff and Lauvao is particularly tough as the club is already without tackle Trent Williams as he rehabs from a thumb injury. As they fight to keep their place atop the NFC East, the Redskins will have to move forward without 60% of their starting line. Scherff, the former No. 5 overall pick in the 2015 draft, earned Pro Bowl nods in each of the last two seasons. He’s continued his strong play into 2018 and is a big reason for Adrian Peterson‘s surprising resurgence in D.C. Behind the Redskins’ offensive line, Peterson has averaged 4.4 yards per game, topped 100 yards in two games, and flirted with the century mark a couple of other times. But, behind a depleted front five on Sunday, Peterson had just 17 yards off of nine carries. At the midway point of the season, Scherff ranks as Pro Football Focus’ No. 11 ranked guard in the NFL. Lauvao, who mans the opposite side, is near the back of the Top 60. The Redskins gave Richardson a five-year, $40MM deal in the offseason to defect from the Seahawks, but shoulder trouble has dogged him as of late. The 26-year-old receiver flashed early in the year, but has been held to just four catches over the past two games. His first year in D.C. will end with just 20 catches for 262 yards and two touchdowns in seven games. Man this pretty much kills our season losing the OL yesterday. edit note: It says Peterson averages 4.4 yards per game (instead of attempt). 4.4 is what he is going to be averaging per game without an O-Line. They can probably start putting together a list of head coach candidates, uphill climb to the playoffs from here. I hope they go in another direction for GM & HC. That’s disappointing. Oh well….it was good run. At least kept me engaged for half the season.